These definitions: 5-st RPC-dec Slip 2 sts to cn and hold to back; k3, p2tog from cn. 5-st LPC-dec Slip 3 sts to cn and hold to front; p2tog, k3 from cn. Are in the stitch glossary of Block 4. But they are not used in the pattern. Please ignore them. Continuous/closed ring cables allow the creation of elements such as circles, medallions and in this case, concentric hearts. This type of knitting uses traditional crossing cables along with special increases and decreases to create and close the overall shape. This is a more advanced technique that requires the knitter to have a working knowledge of crossing cable (learn some of the basics here: Cross Cable with a Cable Needle Video. All of the RPC and LPC stitches in this pattern are variations of crossing cables. Strategic placing of the cables by the designer combined with special increases and decreases are what form the closed heart. 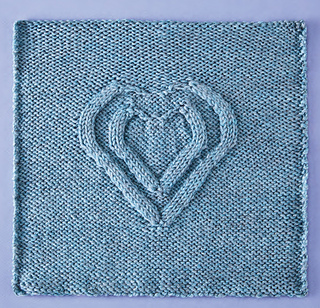 These special stitches are defined step by step in the pattern stitch glossary. Additionally, I found the following videos to be helpful in demonstrating these stitches. The chart stitches are worked between the 2 stitch markers. The number of stitches between the stitch markers changes periodically as stitches are added with increases and removed by decreasing. The chart starts with 27 stitches, increasing to 39 stitches and decreases back down to 27 stitches. The chart is read right to left for even numbered (RS rows) and left to right for odd numbered (WS) rows.